An incident is an unexpected and unpleasant event that had happened in the site that is likely to cause serious problems. Any incident that happened in the site must be recorded. Incident Report displays all the submissions of the users using the incident form. 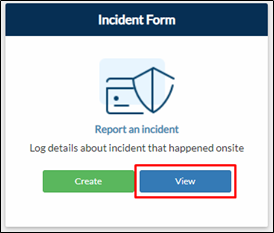 Project Page – Click Risk Management tab > View on Incident Form tile. Projects Dashboard – Click the Reports button. Locate the Incident Report then click View Report. This can be found under All or Risk Management tab. 2. You will be redirected to the Incident Report page where you can view your submissions.